Leave stock coils on shipping pallets and reduce material handling. Pay out precision for high-speed, high-volume operations. For high-speed, high-volume processing of coil stock, our Pallet Master decoiler models are available to handle loads up to 10,000 pounds. A variety of options extend versatility. With Pallet master decoilers, less material handling is required and delicate materials are less apt to be damaged. 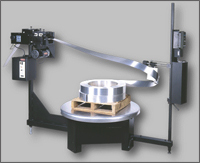 Coils remain on the pallet for convenient loading onto the decoiler turntable, for minimum set-up time. Reduced material handling also improves safety. Combine a Pallet Master with a straightener or Rapid-Roll unit. Designed for modularity, Pallet Master decoilers can be linked to Rapid-Air stock straighteners or Rapid-Roll Power units. Payout, pulling, straightening and loop control functions on stock widths up to 6” can be performed with these space-saving, affordable combinations. Applications with long feed lengths or intermittent duty can employ a straightener or Rapid-Roll to assure continuous operation. For a constant feed rate and a precisely managed loop, any of our Rapid-Roll units can be used with Pallet Master decoilers. The heavy-duty, welded steel frame provides stability and strength to reliably handle maximum coil weights. Highest quality roller bearings provide smooth, dependable rotation. And the aluminum turntable is rust-resistant. Together, these features result in decoilers built to withstand the rigors of the most demanding production applications. Direct drive assures smooth, dependable operation. An efficient, variable speed DC motor is coupled to a precision worm gear drive and centralized controls. Set-up is simple and fast. Loop sensing arm provides unlimited positioning with moveable support posts to mount on any side. Spring-loaded keeper maintains inside diameter of coil. Proportional control combines variable speed operation. Turntable rotation direction - a matter of simple switch selection. Control module swivels for positioning convenience. Taut stock detection capability can be added. Remote jog provides set-up convenience. Outside diameter keeper minimizes clockspringing of coiled material.
. . . Min. Max. Min. Max. Min. Max. © 2016 Allied Machinery Group, Inc.